It was enough to revive the Bulls with a ground out 98-95 victory over the Heat in Wade’s much anticipated first return to Miami. 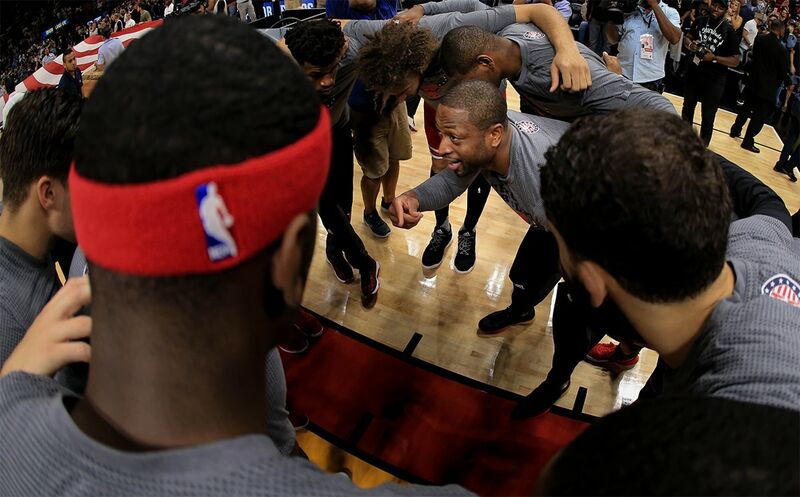 Wade was widely celebrated, from being cheered by arena workers when he arrived, to a touching video tribute early in the game, to the relief of making a pair of pressure free throws with 13.7 seconds left and the Heat within two points. It was a somewhat controversial call, a home call in a sense for the popular visitor. Rajon Rondo was having trouble getting the ball in bounds and it was beginning to look like the Bulls might blow their five-point lead with 19 seconds. Wade cut toward the sideline for the ball and it went off his hand out of bounds. But Justise Winslow riding Wade was called for a foul. Winslow then missed a three and Rondo was fouled intentionally and made both to enable the Bulls to escape. The Bulls moved to 5-4 and the Heat fell to 2-5. 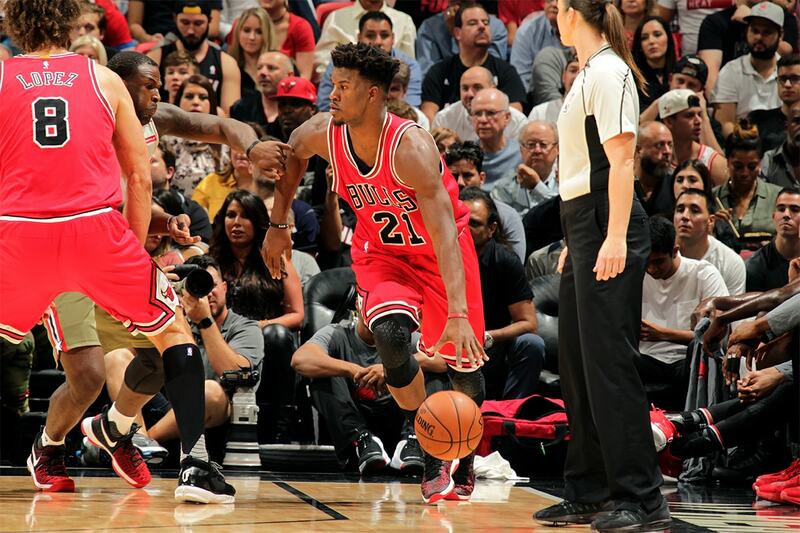 Butler was crucial in the fourth quarter with eight points among his team high 20, all eight in the last five minutes around a Robin Lopez put back after two Lopez offensive rebounds. After just Butler and Wade could get much going in the Wednesday loss in Atlanta, the Bulls had six players score in double figures Thursday. Lopez had his best offensive game of the season with 16 points and nine rebounds with a team most 20 shots. Rondo bounced back with 16 points, 12 rebounds and six assists and the bench came back to life. Doug McDermott had 13 points and Nikola Mirotic 10. 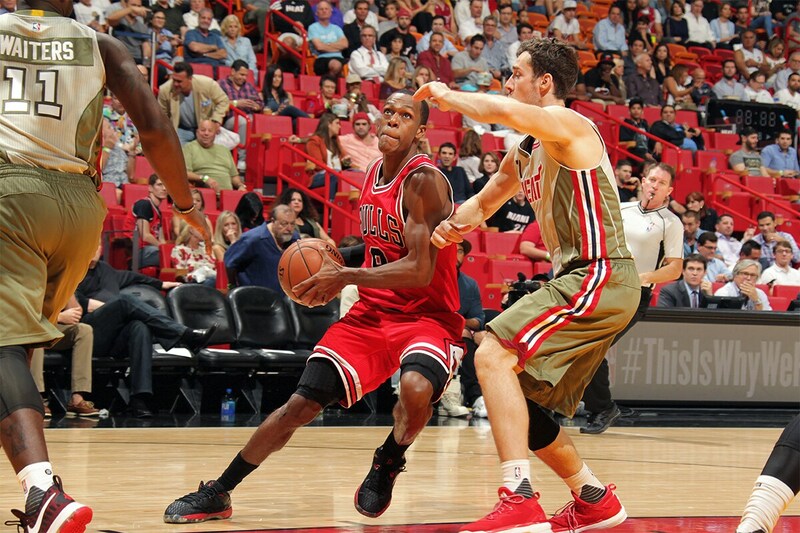 The Bulls got back on the boards with a 48-46 edge even as Hassan Whiteside had 20 points and 20 rebounds. Though was outmuscled for key rebounds by Lopez. The Bulls also endured in a ping pong match of a game with 19 lead changes and 14 ties. And survive, perhaps, was the best way to describe the night for Wade, who called it one of the worst games of his career, though as much in the buildup and expectation of the reaction as his five of 17 for 13 points with seven rebounds, four assists and three turnovers. “I thought I’d shoot better since I’ve known these rims for a while, but I guess that wasn’t in the books for me,” Wade said after the exhausting and emotional 24 hours. It wasn’t the Bulls’ most well played, though better as they talked afterward about lessons from a comprehensive film study session earlier in the day. They were somewhat improved with pressure on the ball to stop penetration. The Bulls did allow enough penetration that Heat players made seven of 11 three pointers in the first half. Miami finished with 13 of 39 threes overall, the Bulls still uncertain at times about closing on shooters. But much improved from the Atlanta loss. The Bulls led 23-22 after one quarter, the early highlight Rondo punching a loose ball forward to Butler breaking out, who them slowed down enough to get Wade a slam dunk. The second unit’s defense with McDermott, Mirotic and Bobby Portis held this time as the teams were tied at 53 at halftime with Lopez the wild card on offense. Though still unaware he can stand at the three-point line instead of three feet behind, Mirotic did make two of three of those extra long threes while McDermott was two of five on threes. Hoiberg stuck pretty much with the short rotation to avoid a fourth loss in the last five. And the Bulls did look weary in the third quarter when the offense went stagnant and into isolation mode as Miami edged ahead 70-66. The Bulls went almost five minutes toward the end of the quarter scoreless. But Miami is 28th in the league in scoring and the Bulls tied it at 70 after three when the Heat failed to score on their last five possessions. It was tied at 82 with 6:13 left when Rondo, aggressively driving on offense scored before Butler’s eight points among the Bulls next 10 to give the Bulls enough space to endure a pair of Miami threes late and that near inbounds pass turnover. The Bulls were just tough enough, which was a relief to an obviously drained, if not overly emotional Wade. Otherwise, it was more a blur of recognition and requirement. This was the Bulls only trip to Miami this season. Wade still has a home there and stayed in it Wednesday night after the team arrived from Atlanta and everyone else went to a hotel. 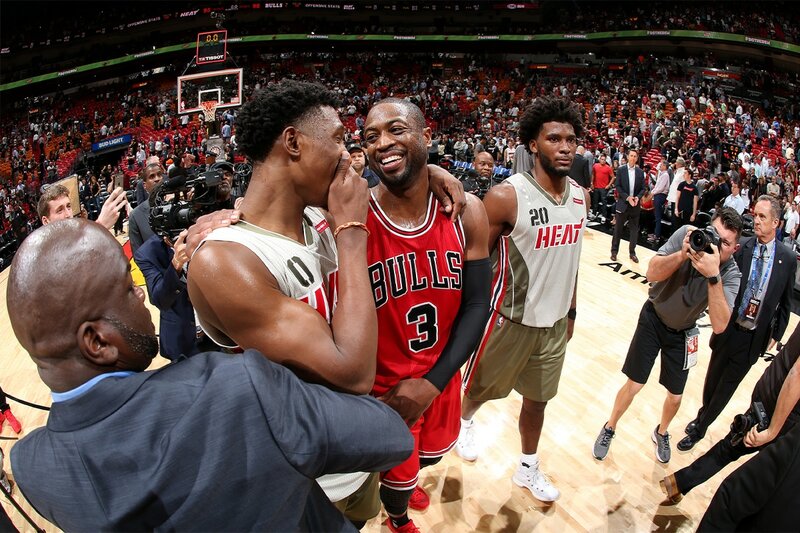 Wade said he mostly consulted by phone with his wife about the house, had some teammates in Thursday afternoon to relax while he later had a short nap and went to the game unsure where now to enter as a visitor, where that other locker room was. Which by the way Wade decided was pretty tacky. “I think the NBA has to do something about these visiting locker rooms,” Wade joked. “It’s not up to code. I think I got taken to a storage room; that’s how little it is. Hopefully there’s good showers after the game because I’m walking into their (Heat) showers after the game (if not). Wade got a welcome ovation when introduced similar to how he was when a member of the Heat after an isolated moment on the bench. The Heat showed an intimate video in the first quarter encompassing Wade’s playing career and community involvement for a player many in Miami said was the most popular player ever in the area. 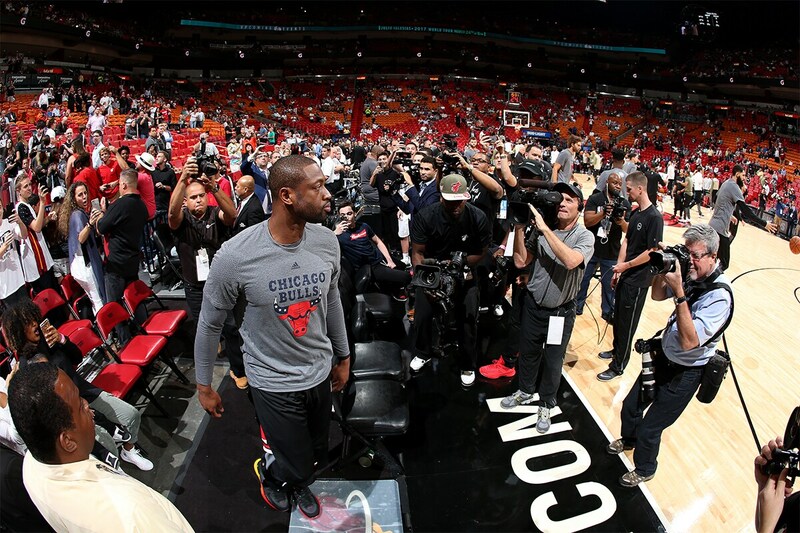 Wade acknowledged the fans after it was shown with a curtain call. He also had to answer again the questions about his relationship with Heat president Pat Riley, who was enthusiastic in support in the stands, but who apparently made the decision not to retain Wade. Wade as he has since summer responded with grace and class in thanking Riley and the Heat amidst the desire to move forward. And Wade never will forget Miami, the heat, and the Heat. “The championships we won here from our rookie year on,” he said about what he’d most cherish. “Memories from every moment, every game. Building something here. Hitting my first game winner in the playoffs here. A lot of great memories. I’ve got some bad ones, too. I got some injuries here. I got some bad losses, but all good from a standpoint of how everything happened in my career here for 13 years. I wouldn’t change it for the world. It was spectacular. When I was a kid, I couldn’t get on my knees and ask God for a better pro career and a better start and a finish of it. I’m proud of it. Back to basketball. They’ve still got work to do.